Soldier Field, the home of the Chicago Bears and part of the Chicago Park District, recently received a complete face-lift. Metropolitan Industries was contracted by Great Lakes Plumbing to manufacture water systems to deal with the various water needs throughout the facility. Metropolitan was chosen for the job because of their knowledge and expertise of controls, pumps, wet wells, and system integration. One of the goals for Metropolitan was to create a storm water system that would take rainwater runoff from the field and remove it from the stadium. This presented a unique challenge because Soldier Field is built near Lake Michigan, which has sandy soil and high ground-water levels. Metropolitan worked within site/project constraints to build an innovative storm water pump system. It was determined by the structural engineers that the storm water collection basins could not be excavated to a level in excess of 7 feet below the floor slab. This barrier made the design of the reservoir and pump system a huge challenge: the system had to handle flows as high as 5,000 gpm. The type of pumps chosen for the storm water system were vertical turbine pumps. This allowed for the pump motors to be located in the mechanical room instead of in the wet well, keeping it away from the water and making it more easily accessible for service. These pumps are able to evacuate water out of a wet well to within 6 inches of the bottom. Metropolitan manufactured special inlet screens to keep trash and debris out of the pumps. These screens were designed with large diameter intake bells, to avoid pump damage. A large collection basin was installed to give the pumps time to react to incoming flows in the range of 100 gpm up to 5,000 gpm. One problem for the storm water system was the volume of water entering the wet well. If the velocity was too high, surface vortices could form. If vortices formed, air would be drawn into the pump. Because this could damage the impeller and pump bowls, a wide wet well intake channel was utilized to keep the entrance velocity into the wet well low. Metropolitan helped design the wet well inlet to maintain an approach velocity of less than 2 ft/sec and sized the intake bells to maintain an inlet velocity of less than 2 ft/sec to each pump. This prevented other pump suction problems, such as swirling. Energy saving variable frequency drives and smart controllers were used to maintain a one foot differential in the water level inside the wet well. The controller would instantaneously adjust the speed of the pumps in direct correlation to the wide variation of inflow rates. These rates were supplied to the controller by the submersible pressure transducer installed in the wet well. The Metropolitan team used their experience and skills to pull the project together for an extremely tough application. In order to score the next goal, a large water pressure booster system with the ability to pressurize up to 3500 gallons of water per minute, was designed to take water from the City of Chicago water main and pump it throughout the entire complex while overcoming any additional pressure losses in the stadium. This is especially important during a game when demand is at its peak. This system consisted of three 100 HP end suction pumps with energy saving variable frequency drives. Part of the contract called for a capacity test of the main water booster system prior to the opening of the stadium. Every toilet, faucet, and water spigot was turned on at the same time. The system automatically adjusted to the increased demand, flawlessly maintaining system pressure. One of Metropolitan’s own service technicians was drafted to coach the system during the first home game. Even during half time, when there is maximum demand, the system continued functioning normally behind the scenes to provide the needed water. Another goal for Metropolitan was getting rid of the “used” water. 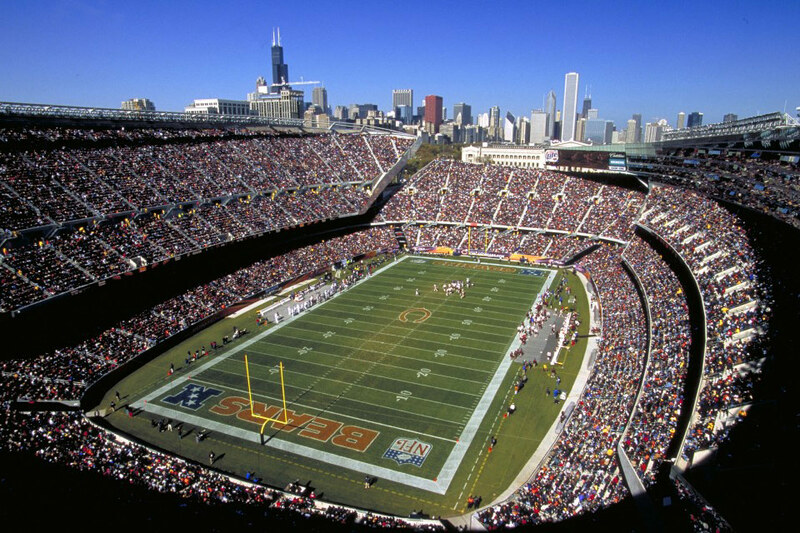 To score this goal, sewage ejector systems were supplied around the stadium to collect the wastewater and pump it to the Metropolitan Water Reclamation District of Greater Chicago. Five sets of duplex sewage ejectors were supplied to take sewage from the various locations around the stadium. Metropolitan supplied Hydromatic non-clog impeller submersible pumps to handle the job. The pump’s design prevents clogging and enables solids up to 3″ in diameter to be pumped. An alternating control panel ensures that both pumps receive equal operating time. Alarms are given if a problem is detected. The final goal was a duplex break tank water booster system to keep the building cool. This cooling tower water feed pump system used two 10 HP end suction pumps with variable speed controls to accomplish this task. The break tank provides a physical air gap to protect the city water supply from contamination. A stainless steel storage reservoir was supplied to provide long trouble-free life. Other pump systems included an elevator pit pump and several large sub-soil drainage pump systems. The sub-soil drainage pump systems faced the same “shallow basin” challenges as the field-drainage system. Metropolitan Industries was chosen as an equipment supplier because of their fine equipment and their reputation for innovative engineering and outstanding field service capabilities. Metropolitan Industries has supplied pump and control systems to the United Center, Comiskey Park (now US Cellular Field), Arlington Park Race Track, the National World War II Memorial, Ford Motor Company, John Hancock Tower, Union Pacific Railroad, and the Sears Tower – to name a few. Chicago Bears fans can relax and enjoy the game while Metropolitan’s pump systems work. Metropolitan Industries is a clear win for the Chicago Bears. Contact Metropolitan for your pumping and control system design solutions.